Charming early chapter book that relates the tale of a little girl who loves picking flowers, hearing birds sing, and the beauty of nature. Audrey adores her parents and they support her. On a rainy day, Audrey often dresses up in her mothers fancy clothes and jewelry, while pretending that she is a beautiful princess. When Audrey is old enough for school, her mother encourages her to dress as she wishes so Audrey appears at school on her first day dressed as a princess. An older student makes fun of her; Audrey races to the farthest point in the playground to hide. A swarm of ladybugs cover her from head to toe and speak to Audrey. They tell her that beauty does not exist solely in outward appearance like the clothes she wears. Audrey is a beautiful princess because she sees the good in others and expresses her goodness in the love that she shows other people. As long as Audrey loves life and expresses herself in the same way toward others, she will always remain a princess. 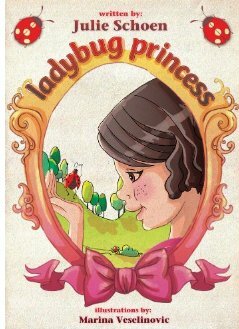 Audrey learns how to deal with bullies, not to overvalue material things, and the importance of self-esteem. A few creative illustrations enhance the beauty of the message in this short chapter book that is appropriate for beginning readers in the seven and up age group. Highly recommended for parents and teachers to boost self-confidence. I think that this book fits the bill for a first grader.